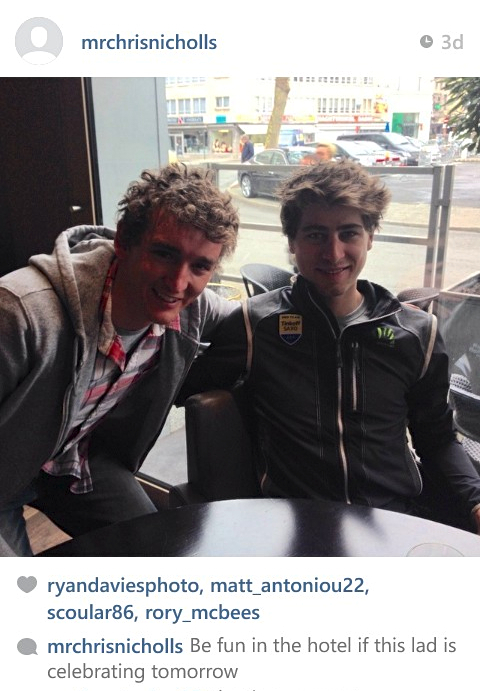 …I tell my brother and his three less experienced cyclist friends that it’ll be fine. We are after all only riding the last 80 or so miles of the course. Surrounded by pretty much every Western European nationality, Belgians, Germans, French, Dutch, Spaniards and Italians, not to mention scores of British riders, this is the biggest ride of this sort I’ve ever taken part in – something like 16,000 riders would be doing the course to some extent during the day. We roll out of Oudennarde at 8.30 in cold conditions and light drizzle. I’m glad I decided to keep my mud guards on. After a mile or so I decide to push on at my own pace. It’s at this point that the narrowness of some of the ‘roads’ we’re riding on strikes me. More like slightly wide pavements. I wonder how on earth the peloton will get down them, let alone the entourage of support cars and officiating vehicles. 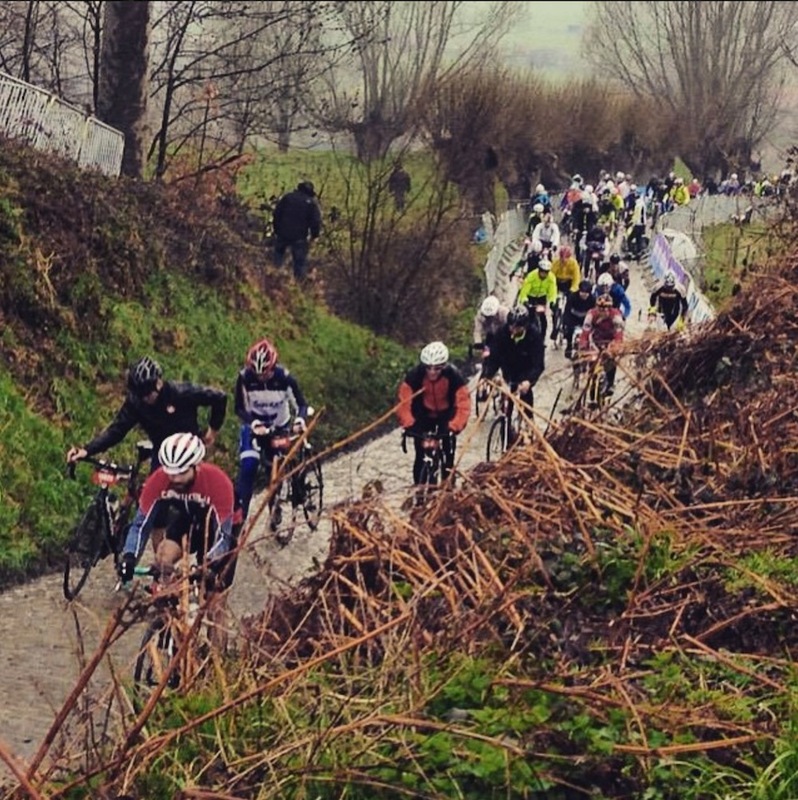 After 10km or so, we hit the first cobbled section. I’d seen cobbled rides on TV a few times before, but not thought too much about it. Riding over them felt to me like trying to use a pneumatic drill on a solid block of steel. The vibration on the hands and arms was intense. During the second cobbled section (Paddestraat, 2.3km in length) the pain in my fingers became intense and I had to try and ride with my palms out flat on the bars and my fingers straight. 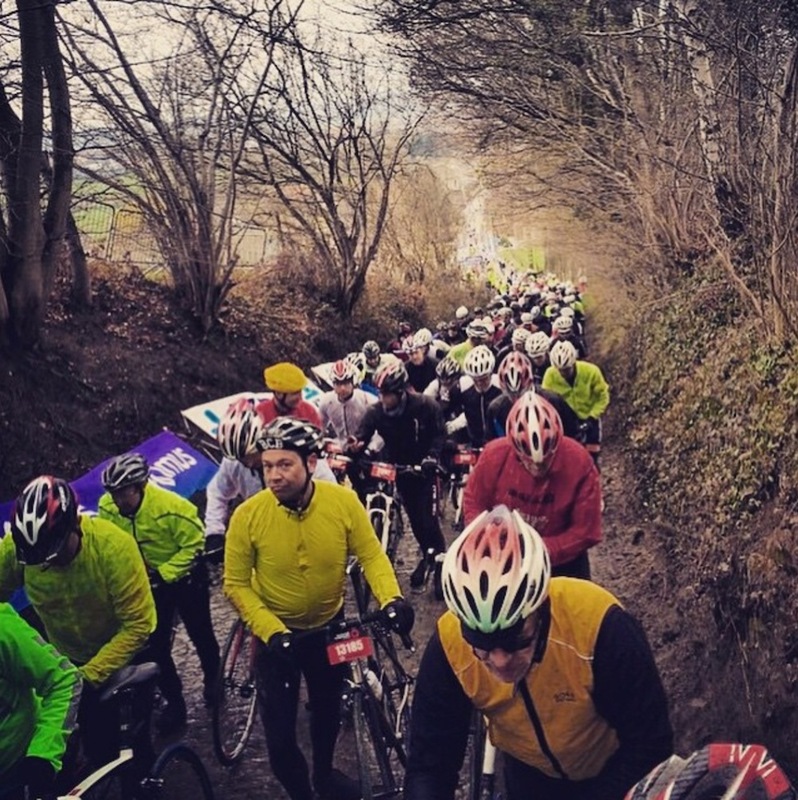 Leaving each cobbled section was often met my with a collective sigh of relief from my fellow riders. The kilometres soon began to tick down, helped greatly by the well equipped feed stations. Some of these were more like mini festivals, with DJs playing to help keep the motivation up. 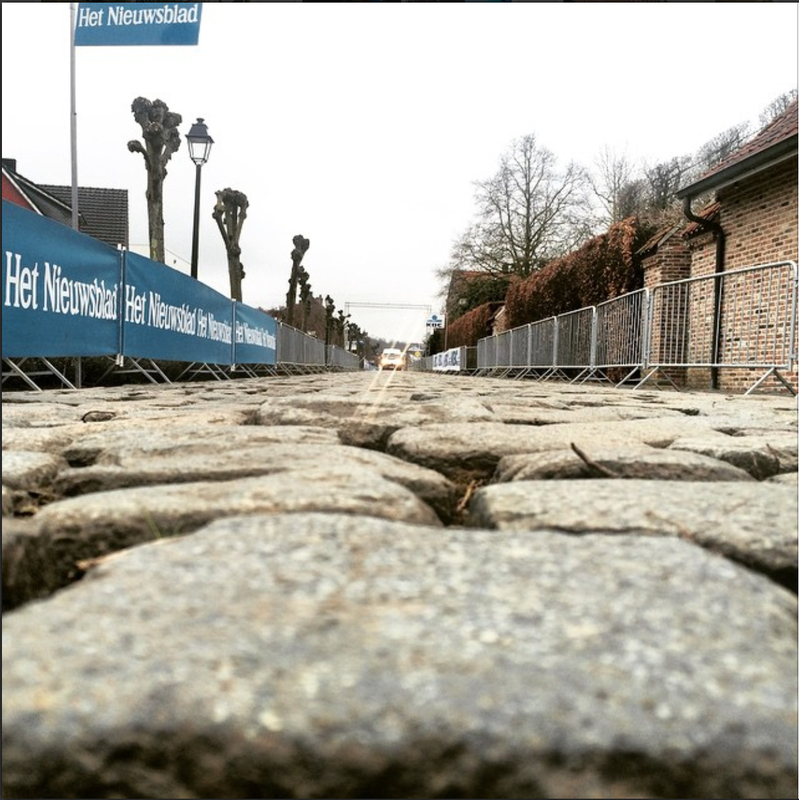 Then along came the cobbled climbs. Koppenbreg springs to mind. I was determined to try and ride all the way up, but was soon met by a wall of walking cyclists, moving conveyor belt-like up the hill. A few hardy souls did make it all the way up, with the crowd scrambling to get out the way as they went by. Trying to keep the bike in a straight line on these climbs was a challenge, especially when wet and slippery. It felt a bit like a version of ‘It’s a knock out’ for bikes. Massive gaps in the cobbles, along with swerving riders ahead meant the bike could suddenly swing out of control. I saw several riders tumble, as well as go careering out of control into the side barriers. 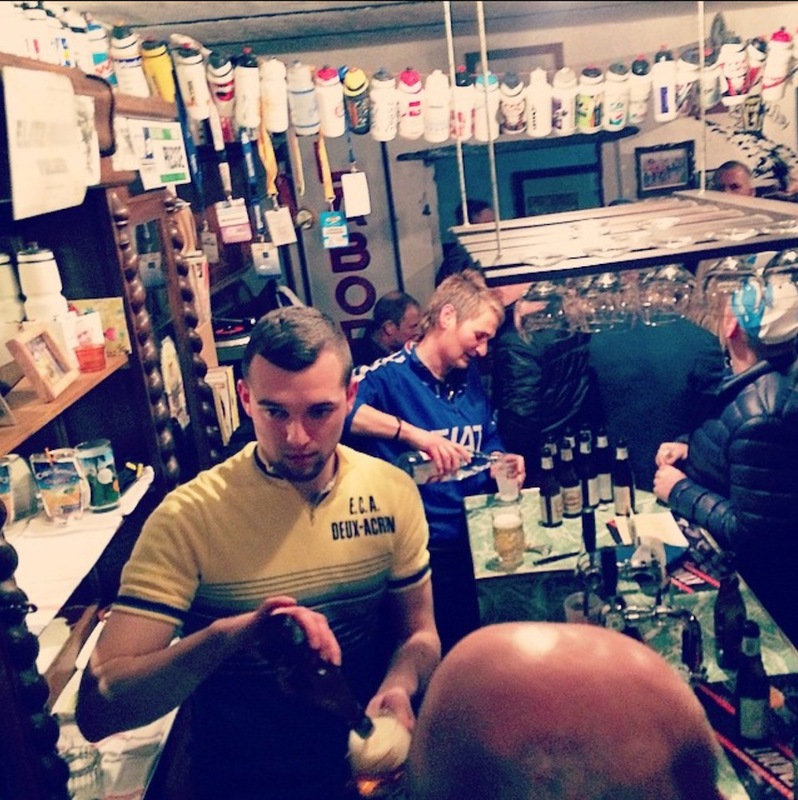 Back in Oudennarde and all exhausted (one of the group with a nasty gash on his leg – ironically due to a crash on the flat at the end) we all agreed that though the cobbles were tough, they were in a strange way also the most enjoyable bit. My earlier comments about “only riding the last 80 or so miles” now seemed like a massive understatement. All in all, a brilliant day, and ride I would highly recommend. 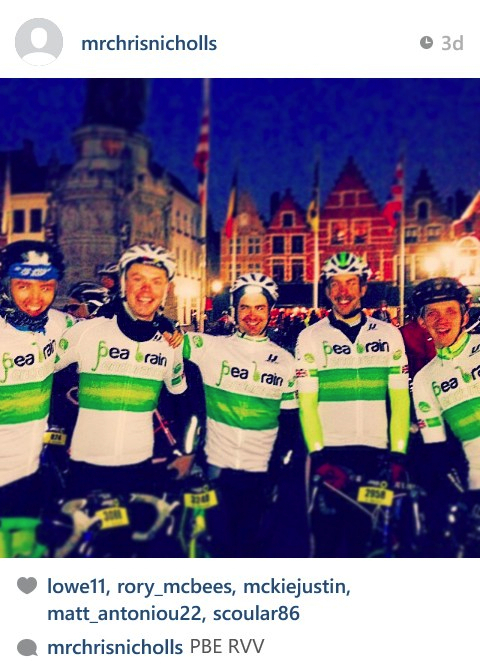 Flanders 2016 anyone? 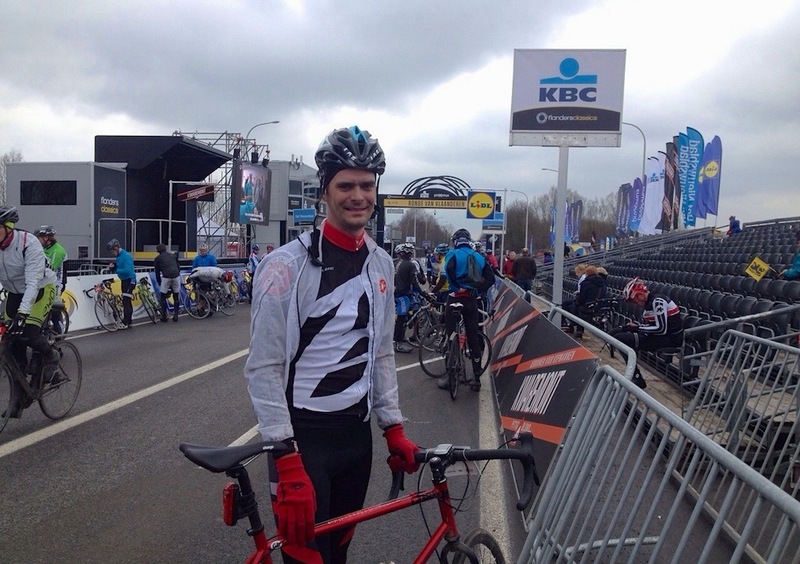 This week’s Ride Report is by Will ‘The Red Baron’ Harrison.